"Oh she's off on another "vacation", I don't know how she gets so much time off from work." Carol keep pretty good tabs on Joyce, that's what happens when your friend drives by your house every day for years. "Where's Sara?" "She's on her way, she's working late again" Betty updates the small Monday Night Quilters group from one of her text messages. Carol is the hostess tonight and she's laid out a feast of yummy looking chicken salad (she used some of that rotisserie cooked chicken) a light salad, rolls and chips. The ladies had just had the usual discussion about poundage, you know, the kind of poundage we find right at the waistline. At middle age, (you will not get any ages outta me) they are constantly fighting to keep their weight in balance. "I work so hard and lose 5 pounds during the week, and then gain it back over the weekend, it's just crap." "Carol, maybe you shouldn't weigh yourself everyday, just on Mondays, at least you wouldn't know how far down you went--just save yourself the pain girl!" Sue makes the practical recommendation. Carol and Betty have swapped glances after checking out the necklace around Sue's neck, it looks like Sue has another high-end piece of jewelry, nothing too flashy, but definitely expensive. Not quite sure where the money came from, she won't even buy any fabric unless it's on sale. Sara arrives, tired and worn out after working outside for most of this hot day in May. She's brought a couple of her quilts to show, but doesn't want pictures taken, she's a little shy like that. Carol talks her into having a bit of chicken salad, even though Sara is not a big eater, she's a lightweight. Carol's granddaughter has started quilting, and she's on her second quilt. "Pictures please" Carol says, she wants Betty to take a picture of the quilt for the facebook page so she can document her accomplishment. Betty looks around the house for a good spot to take the pic. "Ok, right over here, hold that quilt up so I can get a good picture"
"I helped her with the binding" says Carol, "but now when I look, I can't tell which part was done by me, she did such a good job!" This quilt is a gift, for a very special teacher. The idea that a young person can grasp the value and sweetness of making a quilt for someone else warms the hearts of the group. Carol found a sewing machine at a garage sale that was in perfect condition, even though it was old (some of those old machines are now the best). Her granddaughter had been hanging around the kitchen while the Monday Night Quilters meet for several years, and she occasionally got into the middle of things helping with the ironing, the sorting or the holding of quilts for pictures. None of the other ladies had kids or grand-kids that seemed to want to sew, at least not yet. This warm heart'd young lady is a fiber artist in the making, we're sure you'll be seeing a few more pics of her projects. "Ok Sara, it's time for your pictures" Sue guides Sara from her perch at the dining room table and sends her to the sitting room where the best pictures are taken. 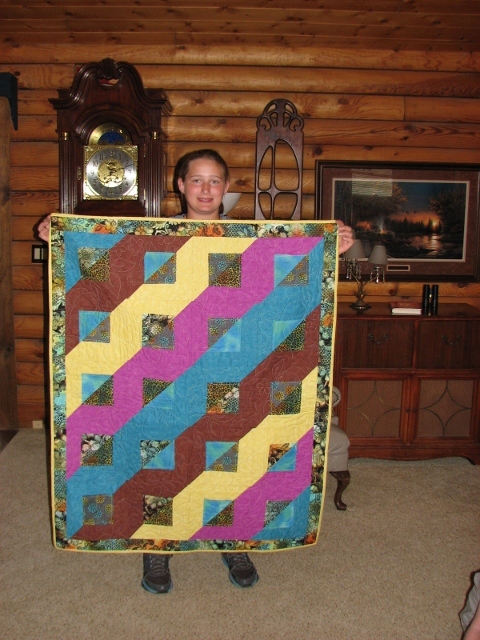 "I don't like the colors in this one, I don't think I'm even going to quilt it". "Oh good grief Sara, it's lovely, and after all that work to fold this beauty up and put it in the closet would be a crime." The picture is snapped and looking through the digital image view, the drama of these 12 different blocks really stands out. 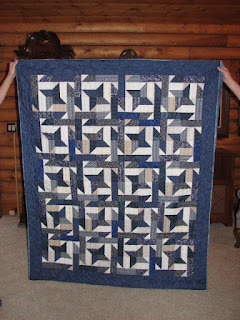 Sara did the flying geese around the border, even though some in the group skipped this part on their own projects. This quilt was one of the group adventures, each picking different fabrics, fun and challenging. "Ok, let's get to the next one"
The next is one of the groups Soldier Quilts. Turns out the Shepherd Montana area is well represented by men and women (our babies) who have become part of the 1% who bravely volunteer to serve our country. Betty went a little crazy when her Son got orders to Afghanistan and thought making quilts for the local soldiers would be a good idea, and she drug her Monday Night Quilting friends along for the ride (they weren't kicking or screaming). 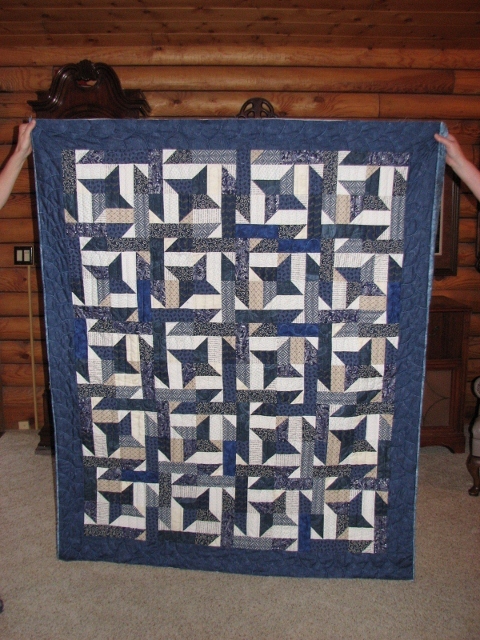 This quilt is for one of the group's Son who serves in the Air Force fixing planes. He is currently on his second deployment to an Air Force Base close to the action. Quilting is part therapy, for those who do the quilting, and for those who benefit from the gift of a quilt. Stay tuned for more, next week! "If we open up our group to new people, what are we gonna do if we just can't stand the new person?" "Oh for crying out loud Betty, I'm pretty sure there's something about me that you can't stand, and you show up every Monday Night!" The gals at the dinning room table snicker, and you just know each one of them, Carol, Sarah, Sue and Betty are thinking about how Joyce never holds anything back, even when she should. The Monday Night Quilters have been meeting at each others homes for over 10 years now, and once in awhile someone new pops in for a few months, but mostly it's just the same old gang of 5. They are very project oriented, some more than others. 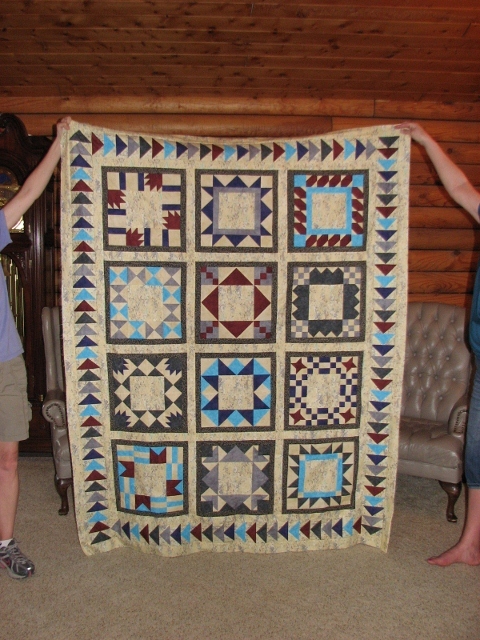 Quilting has been an American pastime for, well, a couple hundred years (ever since there was an America). And the quilting groups have gathered for these "work" events for just as long. "Well I want to know, what would be the goal of inviting more people? How would we invite them? Do we say 'hey do you want to quilt with us?' 'By the way sometimes we don't actually sew, we eat and drink wine?'" Sarah knows some women who might fit into the group. She's mentioned the Monday Night Quilters to a few friends and posts her quilt pictures on her Facebook page; she always gets lots of comments about her work (she has an eye for color). Sue looks at Sarah and in a haughty tone "we do too quilt, or at least we talk about quilting"
"And we solve at least one or two world problems per week, if only quilters ruled the world!" Everyone laughs at Carol's joke, quilter's rule, get it? "All right, what about our next project? 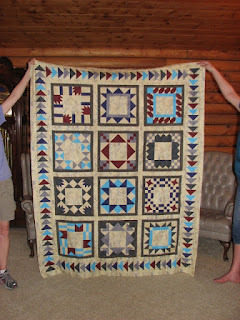 Shall we do that Friendship quilt we've been talking about for years?" "Betty, if you would just organize the darn thing maybe we can get going. I'm not gonna go hole hog on a new project till I get my garden going, plus I've got a bunch of company coming." Carol has a very full plate, not sure how she gets everything done. This summer her house is like a revolving door for her family who come to visit from all over the State of Montana. We think they come for the cooking! "Well how 'bout we make a decision on what we're gonna do and then start gathering our materials?" Sue remembers having this conversation a couple of times over the last 2 years. Even though the group has quilted projects from the same patterns, they haven't decided on their Friendship blocks. "You know, we could do something like block of the month. Everyone pick a block they like, and then once a month we all work on that block from our own stash. Just see what happens. Bring the blocks to the first meeting of the month and see what we get." "And if you don't get your block done there needs to be some kind of consequence" says Betty, "something really traumatic, like you have to do all the ironing". "Ok" Joyce chimes in, "let's put some numbers in a hat next meeting and who ever draws number 1 gets to have their blocks done first". Stay tuned for the next Monday Night Quilters episode.